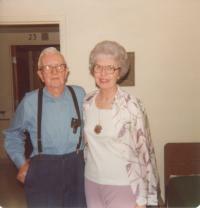 Arnott and Vederoff Ancestors - William Adkins Stevens with daughter Alice Joyce "Susie" Arnott. Photo taken in 1978 in the nursing home in which he resided until his death. El Paso, Texas. William Adkins Stevens with daughter Alice Joyce "Susie" Arnott. Photo taken in 1978 in the nursing home in which he resided until his death. El Paso, Texas.